In a major setback to Chinese President Xi Jinping’s ambitious One Belt One Road (OBOR) project, the Malaysian Prime Minister Mahathir Mohamad has signalled a major shift in the way his country wishes to do business with Beijing. Malaysia has deferred the $20 billion East Coast Rail Link (ECRL) project. Malaysia is not the only one. Other nations are raising their concerns about China’s ways. In fact, Malaysia even quoted Sri Lanka’s example. Here is an opportunity for New Delhi to engage with these countries and make up for lost time. But India is not able to benefit from this new wave of disenchantment because of its own inadequacies in implementing mega projects. The stalled 688-km three-phase rail project, connecting Klang Valley, Kuantan, Kuala Terengganu, Kota Bharu and Tumpat in Kelantan, was to link important ports on the east coast to the western port near Malacca. The seven-year project holds immense strategic importance for China because it will give Beijing a permanent base in Kuala Lumpur besides a port to keep a watch on Strait of Malacca. Malaysia is said to have raised RM55bil from China – 85 per cent of the loans were provided by the Export-Import Bank of China and 15 per cent by Islamic bonds. Two energy pipeline projects, worth nearly $2.5 billion, have also been suspended by Malaysia. All these deals were inked with China under the previous Najib Razak government. The former Malaysian PM is undergoing investigation for allegedly “selling off” the country to China in exchange for help in settling debts linked to the $700-million 1MDB ­scandal. Investigations revealed the deep inroads made by Chinese agencies into the government and administrative systems of Malaysia. But China Petroleum Pipeline Engineering (CPP), a unit of China’s state-owned oil and gas giant China National Petroleum Corp, had refuted a media report that money paid for the pipeline projects in Malaysia was diverted to third-party Cayman Islands companies involved in money laundering. However, suspending these projects is not easy for the country. The Malaysian economy needs reconstruction and the biggest worry for the trading country is finding jobs for teeming millions. Little wonder that Mahathir, while cancelling the two multi-billion dollar contracts said, “When it involves giving contracts to China, borrowing huge sums of money from China, and the contract goes to China, and China contractors prefer to use their own workers from China, use everything imported from China, even the payment is not made here, it’s made in China … that kind of contract is not something that I welcome”. Meanwhile, China may have bagged yet another controversial port contract with El Salvador, stepping on the toes of Taiwan, which has formal relations with just 17 countries now. But Taiwan has vowed to fight China’s “increasingly out of control” behaviour and efforts to squeeze the island. Taipei has expressed its willingness to work with ‘countries with similar’ values to take on China. China combined its OBOR projects with “Africa Outreach” policy following Xi Jinping’s 2015 strategy of ushering in a “new era of win-win cooperation”, fully backed with a commitment of $60 billion investment in infrastructure projects. From taking over copper, uranium and gold mines to constructing Chairman Mao Zedong High School in Otjomuise, a suburb of the Namibian capital Windhoek, China has aggressively registered its presence in each of the 54 African countries. Realising that by 2050 Africa will have more than 25 per cent of the world’s population, China’s approach towards Africa is in stark contrast to that of the US, Europe or India. India’s two-way trade with Africa is estimated to reach $150 billion dollars from the present $52 billion while China’s trade with Africa is estimated to double by 2020 from the current $200 billion. This is just the Africa story. The rest of Southeast Asia and the western markets too seem far from New Delhi’s immediate comprehension. While China had to struggle to recalibrate its state-sponsored socialist economy to market-friendly capitalist economy, India had a sufficiently good head-start with a strong and vibrant private sector and highly evolved economic institutions. Some of the finest multi-lateral institutions such as BIMSTEC and IORA were India-centric and depended on major contribution from New Delhi. 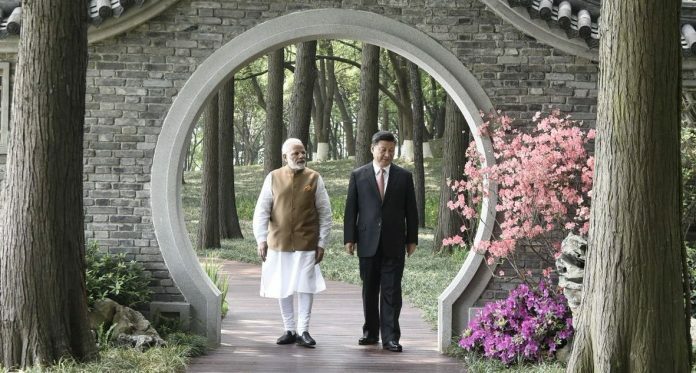 Many African and Southeast Asian countries are uncomfortable about Beijing and increasingly looking to New Delhi for support and economic engagement without strings attached or any fear of their sovereignty being trampled upon. But India’s track record in carrying out projects in a timely and efficient manner has been shoddy. We are still lamenting “the low share of goods and services exports” and lack of improvement in skills and human capital, as admitted by Niti Aayog vice chairman Rajiv Kumar. At this rate, it may take another three decades to reach where China is today. Above all, the lack of a strong political will and huge gap between promise and project completion remains our biggest challenge. The author is former editor of ‘Organiser’.